I recently read the following blog post post by Matthew Sag, "One More Sign World Is Shrinking – eBay is for Suckers". It compelled me to tell my story as well; though mine isn't as clear-cut as Matthew's, it's another example of the Buyer-is-always-right-no-matter-what mentality that eBay has taken in recent years. Unfortunately, eBay is now a marketplace for people selling esoteric items that you cannot find elsewhere (at huge mark-ups) or re-packaging things from Walmart. I'm not sure where I'll sell my occasional items at this point, I'm not a fan of Craig's List (where people that believe Garage Sales charge too much), but have tried Let's Go (and sold a few items). I'm open to suggestions. My family was preparing to move and we were going to have to downsize quite a bit. We had accumulated a lot of higher-end items and I didn't just want to donate everything (though we ended up donating a LOT), so I decided to sell a bunch of stuff on eBay. I've been a member of eBay since Feb 09, 1999, and my current rating is 100% positive feedback with 202 feedbacks. You'd think that type of reputation would get me a little understanding from eBay, especially since I've been a member for 17 years...nope. 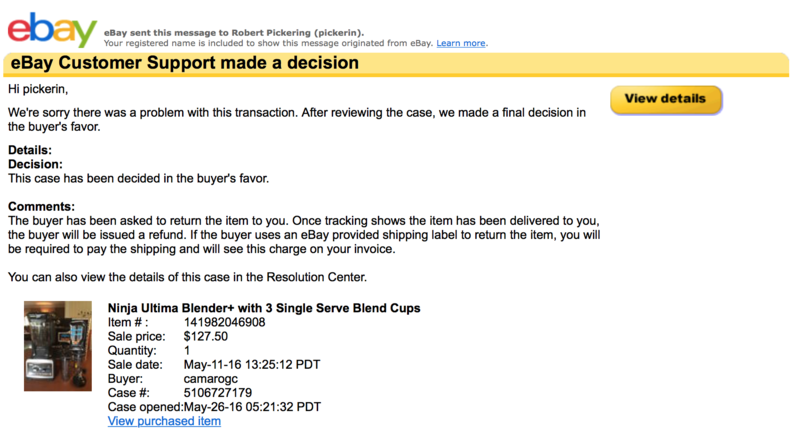 On May 4, 2016 I posted the following item for sale: Ninja Ultima Blender+ with 3 Single Serve Blend Cups (I wish I could link to the original posting, but eBay now deletes them after 90 days, another example of siding with Buyers). It was in PRISTINE condition having been used about two dozen times. I packaged it in the ORIGINAL boxes with all of the original packing materials and manuals, after cleaning it. I normally wouldn't post someone's mailing address, but since this person abused the eBay Money Back Guarantee, I want folks to know to avoid them. Additionally, the name and address will come back in a bit. Unfortunately, my family was in the midst of moving our household and I was commuting back and forth to the West Coast at the time, so there was a delay in me shipping the item...that was totally my fault. The Seller sent me a message through eBay asking for the Tracking Number, I didn't have one and explained that it hadn't shipped yet, I ended up shipping the item out on May 17th (6 days later) for arrival on May 19th (Two-day Priority Mail). I notified the Buyer of the Tracking Number on May 18th and believed everything was good. Huh, that's new news. At no point did the Buyer mention a delivery date issue. Also, s/he is now threatening to open an "Item Not Received Request" with eBay, yet they KNOW they will get the item the next day (they have the Tracking Number). Also, the item is SHIPPED, this isn't a Refund, it's a Return. I responded back that the item had shipped and that they were going to receive it, in good condition (excellent in fact), so that opening an "Item Not Received Request" wasn't necessary. I apologized for the delay in shipping, but I was clearly within the delivery window posted in the Advertisement, and at NO TIME had I provided any delivery guarantees. The Seller insisted that I refund his money, I politely declined as he had the item, it was in the condition stated, and I felt the transaction was completed in good faith. He then responded, telling me that if I didn't accept a return, he would file a dispute with eBay and I should "just refund my money, eBay is going to side with me no matter what". I was dumbfounded and stuck to my guns. 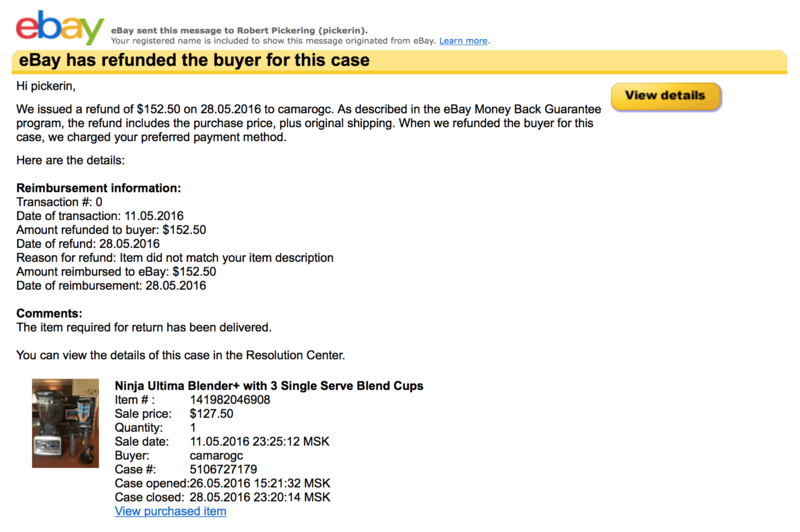 On May 26, 2016 he opened a Case with eBay with the claim "Item did not match your item description". Which is crazy, if anything it was BETTER. There was also NOTHING in the item description talking about shipping and I was sure that after reading the emails between the two of us, eBay would side with me. 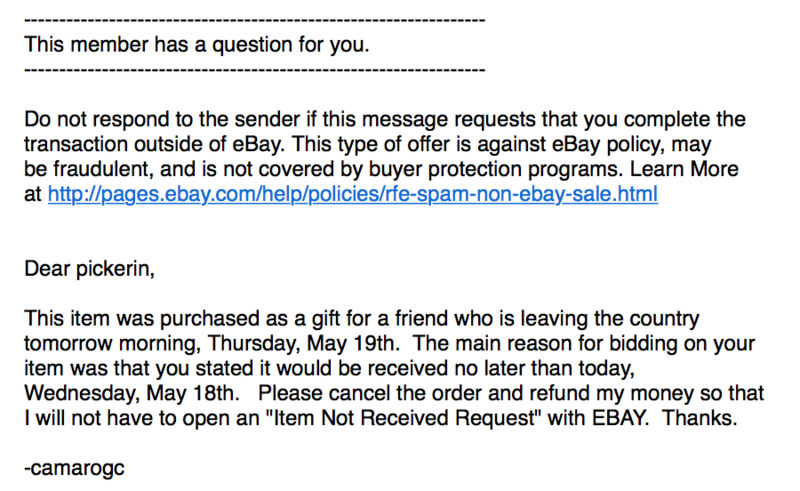 Here's the bad part...eBay never asked for my side of the story. They only, in theory, read the email exchange between us. There was nothing in my description about shipping, or timing, or guarantees of arrival. Worse, they stated that "Once tracking shows the item has been returned to you, the buyer will be issued a refund". Here's the thing, eBay owns PayPal, and they'll only accept PayPal, so they have access to pull money from your account, no matter what. He could have shipped me back a brick with a Tracking Number and I'd have been out both (he didn't), but this is exactly what happened to Matthew Sag. So, eBay only sides with the Buyers, period. I wonder how that model will work out for them when there aren't any? Let that sink in...the ONLY feedback that a Seller can leave is POSITIVE. How does that build trust? Address confirmation is useful because it provides a way for a seller to verify a buyer's identity. An address remains unconfirmed because PayPal does not yet have enough information to confirm it. Although sellers can ship to an unconfirmed address, they can be more confident when shipping to a confirmed address. Also, in order to be covered by the Seller Protection Policy on eligible transactions sellers must ship to the confirmed address on the Transaction Details page. camarogc (90) - 100% Positive (because Sellers cannot leave anything but Positive feedback), member since Oct-28-2012, has only sold 3 items on eBay. I'll never post anything for sale on eBay again. FWIW, eBay did just institute a Report a Buyer function. Too little, too late.